Travel pillows are, generally speaking, unitaskers. 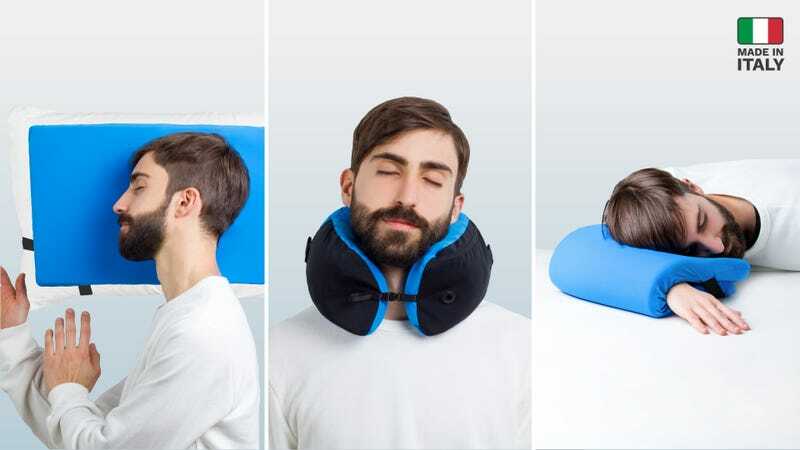 They strap around your neck and (hopefully) support your head when you doze off on a train or airplane, but otherwise, they don’t see much use. Omni-Pillow challenges that status quo with a brand new design, and you can save big by preordering it through Kickstarter today. At first glance, Omni-Pillow looks like your typical U-shaped travel pillow. But untuck the sides from its built-in pockets, and it transforms into a 22" x 12" rectangle of memory foam you can use as a pillow topper in a hotel. Fold that in half, and it becomes thick enough to use as a pillow on its own. Wrap it around your arm, and you can (sort of) comfortably lay your head on a tray table or desk. The material surrounding the memory foam core is water resistant, easy to clean, and most importantly, cool to the touch. My only complaint is that it takes a little bit of experimentation to figure out the various origami folds you have to go through to transform the Omni-Pillow from one for into another, and there are no instructions or hints printed on the cover itself. But I found all of the permutations to be very soft and comfortable, and if Omni-Pillow helps you get even an extra hour of sleep on a long flight, it’ll be well worth the minimal hassle.